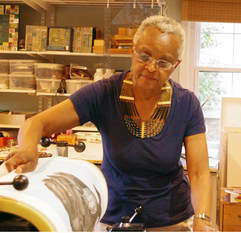 Annette Gandy Fortt is a visual artist working in print, and paint for over thirty years. Annette Fortt combined her work as an artist with her teaching career in public and private school systems. In 2006 She retired from teaching and has since focused on her craft working in paint, print and assemblage media. Annette was born in Memphis, Tenn. in 1944. Receiving her early education in the public schools Of Memphis and New York City, She later earned the Bachelor Of Science degree from Memphis State University (now the Universitv Of Memphis) majoring in Art Education and the Master Of Fine Arts from Pratt Institute, Brooklvn, NY in 1983. From 1983 to l985 she worked at Blackburn's Printmaking Workshop in New York City Where She was the recipient of the Jerome Fellow Award for emerging printmakers. During that period her work was featured in invitational and juried Shows in New York City and environs, Martha's Vineyard Massachusetts and beyond. She moved to the Washington DC area in 1985, where she continued her work in painting and print showing locally and internationally. As an artist and a teacher, she was the recipient of two "Artist in Residence" awards through the National Endowment for the Arts, working with a prison program and with elementary school children. She eventually returned to teaching Art in the public schools of Montgomery County Maryland. Now retired, she says, "Retirement has been a time to exhale and enjoy the freedom of creating without distraction." "I draw inspiration from the natural environment, the people I encounter day to day, and the intrigue of what is current and trending. The old, the new and the numinous are all a part of my belief system, and find their place in my expression."